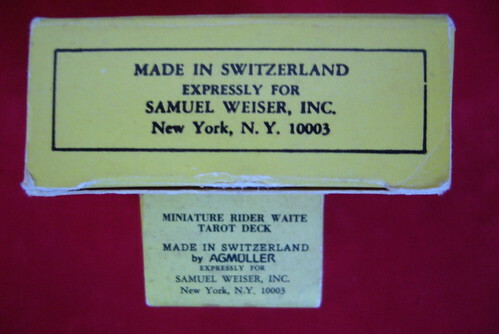 Samuel Weiser Miniature RWS with a US Games LWB ! Unfortunally I have no answer to this. I don't have any Weiser edition of the RWS. I didn't know there was a Weiser edition . Although I have almost every clone version, except for a real Merrimack. (I only have the Shackman). I will have to look into this version now. sorry for reopning a past thread but this is fascinating to me ... I didn't know weider decks were a thing until recently. I have a non Weiser mini /first edition LWB with the park st. address. how long was the weiser transition for decks? How long was the weiser transition? I would say the Weiser miniatures were distributed from 1978-1985. 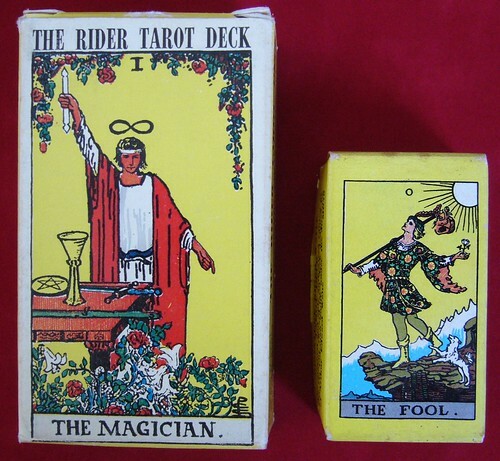 And the Weiser standard sized decks from around 1970-1973. The LWBs in the Weiser minis have both Park Ave & 38 East 32nd addresses. This probably indicates their date is from the late 70's through to the mid 80's. 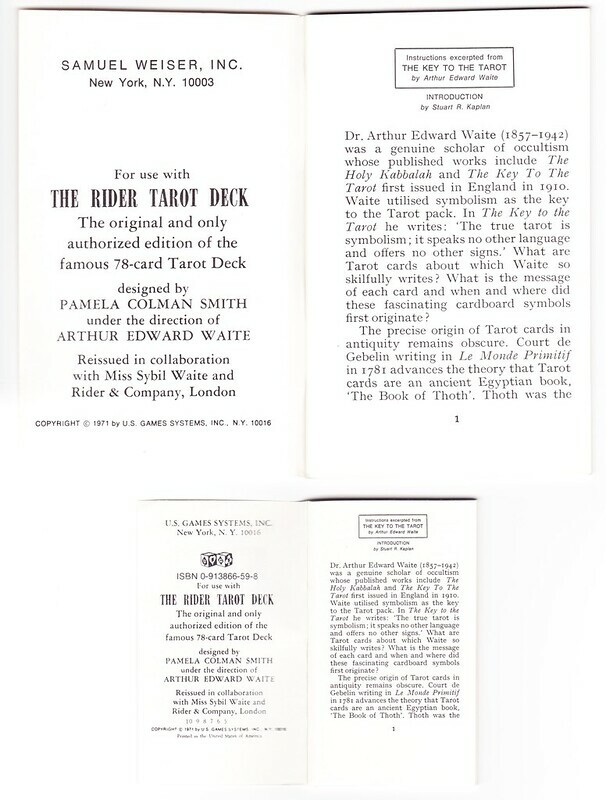 I am inclined to think that Weiser had an arrangement with U S Games about a decade earlier (the early 70's) for the standard sized decks. In my standard Samuel Weiser deck, the front page of the LWB has SAMUEL WEISER,INC 734 Broadway, New York, NY 10003. The inside page states © 1971 U S Games...N.Y. 10016. The cards are NOT stamped "© 1971 U S Games", which dates them to around the early 70's. At best these dates are my 'informed guesstimates' only, and I welcome corrections. 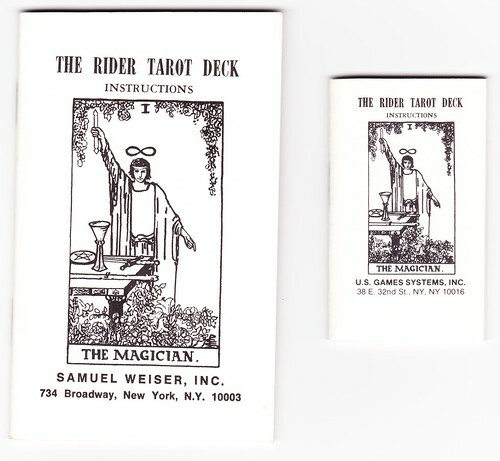 Muller & Cie printed Rider's 'Traveller's Tarot' & USG's & Weiser's miniature cards. The secrets of the dates will be discovered in the boxes and the LWB's. I wonder if any Aeclecticians have a contact from Muller's glory days...? The 38 East 32nd Street NYC address was used through 1988. A few years ago I contacted a librarian at Stamford, CT and asked if they would check their old phone books and tell me the first year US Games was listed; they got back to me and said 1989. Not to nitpick, it's only a couple of years, but in case anyone's interested. Thanks Abrac. My dates were the result of an Aeclectic Forum search I performed many years ago - thanks for this concrete date. Deck 'dates' are tricky at the best of times; do we mean when they were printed or when they hit the streets? 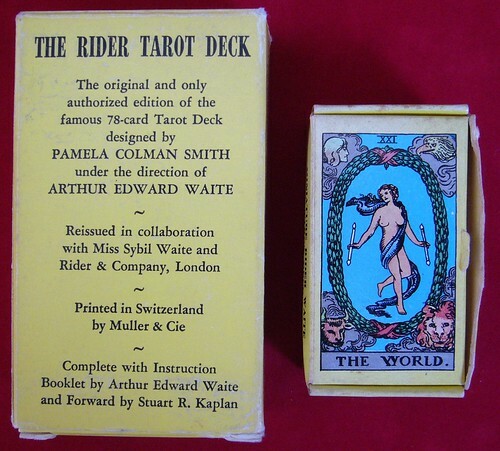 I imagine that Muller did huge Waite-Smith print runs and that significant numbers of these decks spent some years in the Muller, then Rider & USG warehouses before being released. 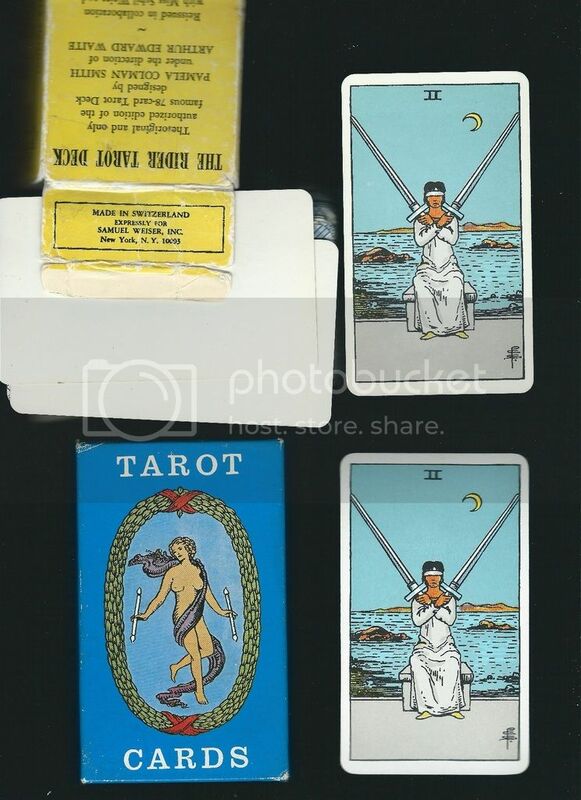 The RWS decks that appeared after USG claimed their copyright in 1971 but before we saw the © appearing on the cards have a special place in my heart. It's not only the card stock and the silky matt lamination - but in some ways they represent the 'last of the free'. So perhaps a mid-80's Samuel Weiser mini, with a USG 38 East 32nd Street LWB and non-© cards would be the most percious of the precious? Nothing to add to what Richard has said competently. Just some scans & pics to give an idea of what is perhaps my favourite RWS for its matt yet smooth lamination. Due to its size the © is very discrete on the mini. The cardstock of this latter one is less smooth such as the one used for the Blue Box editions. Philippe, I shall spend some time over the weekend comparing the depth of the colors between the Weiser and Rider Blue Boxes - I hope mine are different too! Regarding The Fool's face - I am lucky enough to have 3 'tuckbox' blue boxes. One Fool has sunburn, the other 2 don't. 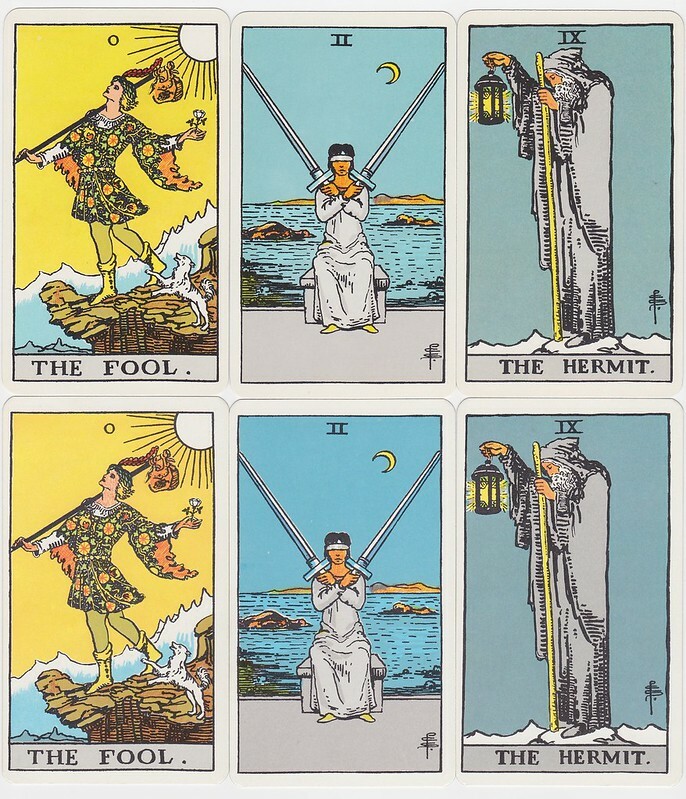 Similarly with the 2 part blue boxes, a couple of The Fools have the red streaks, but most don't. As I recall this phenomena is discussed at length in other forum posts. And as always, the way you embed pictures in your posts is a joy to behold! Sorry for jumping in. Novice RWS here. Which one is the "Rider blue box"? Thanks in advance! 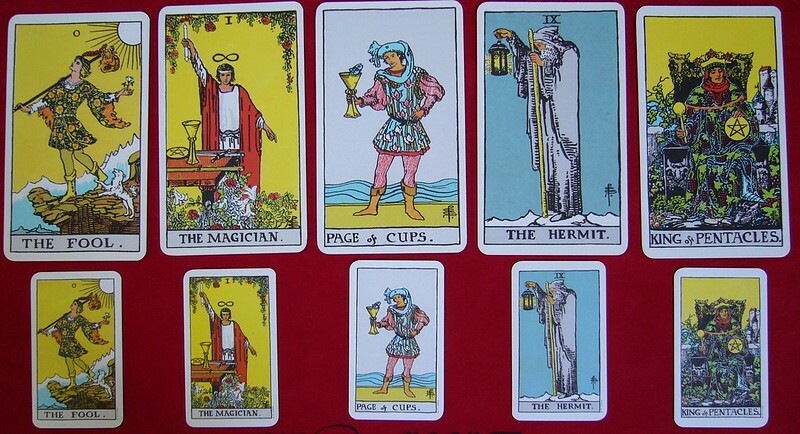 The 3 cards along the bottom row (in Philippe's post above) are from the Rider Blue Box. Philippe is correct - the Rider Blue Box have deeper colors!